Vice President Pence and Attorney General Jeff Sessions attend a Cabinet meeting with President Trump on Monday. 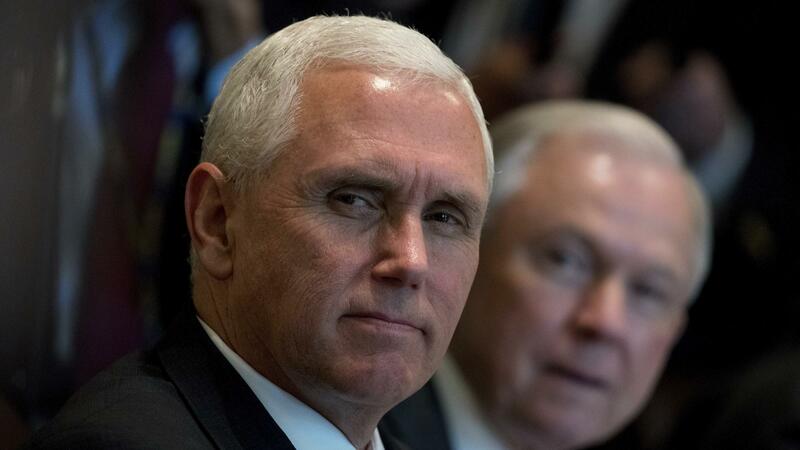 Less than a month after President Trump hired an outside lawyer to deal with inquiries related to the Russia investigations, Vice President Pence has followed suit. Pence's office confirms he has hired Richard Cullen, who served as U.S. attorney for the Eastern District of Virginia during the term of George H.W. Bush and later worked on George W. Bush's legal team during the 2000 Florida recount. An aide tells NPR that the decision to hire an outside lawyer has been under consideration for weeks, and Pence decided to go forward with it earlier this week. The vice president's communications director, Jarrod Agen, said in a statement, "I can confirm that the Vice President has retained Richard Cullen of McGuire Woods to assist him in responding to inquiries by the special counsel. "The Vice President is focused entirely on his duties and promoting the President's agenda and looks forward to a swift conclusion of this matter," he added. Pence has not come under any particular scrutiny over the course of the Department of Justice Russia investigation. As head of the Trump campaign's transition committee, he was involved in the hiring of Michael Flynn as national security adviser. Flynn was forced to resign after misleading Pence about his contact and conversations with Sergey Kislyak, Russia's ambassador to the U.S., during the transition. Pence's choice for outside counsel contrasts with the president's. Richard Cullen has a long record as a high-profile attorney in Washington, particularly in Republican circles. His official biography from McGuireWoods lists, in addition to his time at the Justice Department, his experience working for former Sen. Paul Trible, a member of the Senate committee that investigated the Iran-Contra scandal, and his work for Rep. M. Caldwell Butler, a key Republican vote on the House Judiciary Committee who voted in favor of impeaching Richard Nixon during Watergate. Marc Kasowitz, the outside counsel hired by President Trump, does not have experience in politically charged cases. He has represented Trump for years in civil matters, including a libel suit against a Trump biographer that was dismissed. Kasowitz's background is in litigation and securities law, and his professional biography notes: "Described by CNBC as the 'toughest lawyer on Wall Street' and by Bloomberg Financial News as an 'uberlitigator,' Marc E. Kasowitz is widely regarded as one of the preeminent trial lawyers in the country." He also has represented banks owned in part by the Russian government. Kasowitz and his spokesman have served as public attack dogs in defense of Trump in the Russia matter. He delivered an on-camera statement sharply criticizing James Comey after the former FBI director's recent testimony before the Senate Intelligence Committee. Pence praised Trump's "decisive and strong leadership" when he fired Comey in early May. He told reporters that the president fired Comey due to the recommendation of Deputy Attorney General Rod Rosenstein shortly before Trump contradicted Pence and other surrogates by telling NBC News he was thinking about the Russia probe when he fired Comey. It appears that decision may have played a large role in triggering special counsel Robert Mueller to investigate Trump for possible obstruction of justice, as the Washington Post reported Wednesday night. Trump lashed out at that report at various times on Thursday through his Twitter feed, even recalling language from the campaign to criticize Hillary Clinton as "Crooked H."